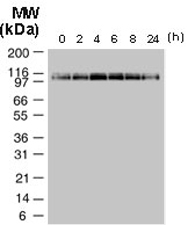 Product description: Rabbit polyclonal antibody raised against synthetic peptide of NLRP2. 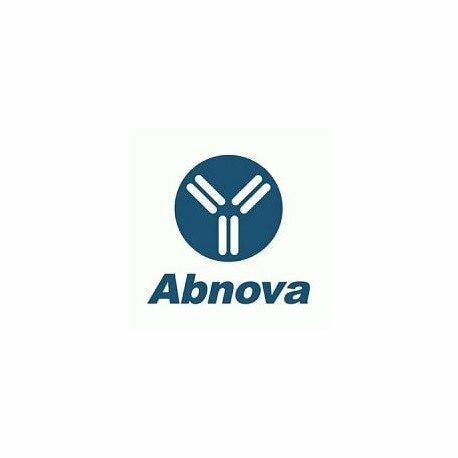 Immunogen: A synthetic peptide corresponding to amino acids 144-159 of human NLRP2. Application image note: Western blot analysis of NLRP2 in differentiated THP-1 cells following IFN (interferon) g stimulation using NLRP2 polyclonal antibody (Cat # PAB0267) at 1 : 2000. TPA-differentiated THP-1 cells were cultured with 1000 units of IFNg for 0-24 hours as described in Bruey et al, 2004. Culturing differentiated THP-1 with IFNg resulted in transient elevations in NLRP2 expression which peaked at 4-8 h after INFg treatment.